Anna who is Magic: For Sarah. I will start off by saying that no, I don't have children. I will also say that I grew up with two younger sisters and two younger brothers with parents who worked and/or volunteered, etc. on the daily. I will also say that I don't mean to be controversial, but I do want to say this because I feel like someone needs to speak for the other side. I understand that having children changes your life. I understand that being a parent is the hardest job on earth and takes so much out of you. I understand that when you're a parent, you're on call 24 hours a day. But I will also say this -- you chose to be a parent. It really, really burns me up. I could tell you about working two full-time jobs while going to grad school and being a member of several nonprofits in town. I could tell you how my other friend Sarah and I were told last school year -- while we were putting in 12-14+ hour days 6 days a week -- that we'd "understand what it means to be busy" when we had children. I could tell you how, at one of my previous jobs, I was told by the same woman at least three times that I couldn't actually be busy because I didn't have children. But instead, instead I'm going to tell you about my friend Sarah Walling. Sarah is an attorney it town, which is a stressful enough job on its own. No one would blame Sarah if she didn't have time to volunteer for things because she works 34985793 hours a week. However, if you want something done, you ask Sarah. Need someone to take money at the door of your event on Saturday morning? Sarah's there. Need someone to buy a ticket to a fundraiser? Sarah buys two. Need someone to buy Christmas presents for some kids you know who are without? Sarah's got you. Need someone to collect food for your food drive, host a meeting, drive donations somewhere, or bake for a bake sale? Sarah will. And she won't complain about it. Which is why, as burnt up as I get about myself when I hear or see someone saying I can't possibly be tired/exhausted/busy because I don't have children, I get even more fired up when I think that Sarah sees that stuff, too. In fact, she sees you posting this on your Facebook page and she gets your emails, and, ironically, she sees it from people whom often she JUST DID SOMETHING FOR. Again, I (and Sarah) understand the ridiculous amount of physical and emotional energy it takes to be a parent. And my hat's off to you for your good work. 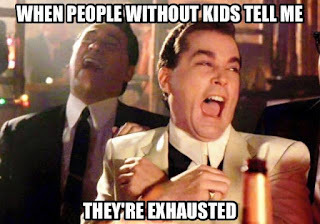 But I also know that, yes, we childless people can also get tired, too. 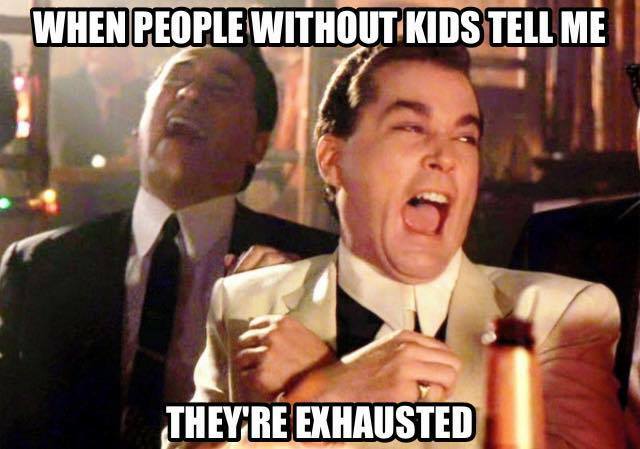 We have just as much right to being tired or needing to relax as parents do. 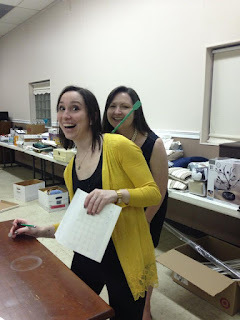 Yes, we do these things because we're happy to do them and we want to help. Period. But it hurts that people tell us we can't be tired or busy ever. I know what you're thinking -- you don't have kids, so you don't understand. I think what makes me the most sad is, why is it a competition? Does it somehow make life better for you if you win the "I'm more tired than you!" contest? I know so many parents who are able to get through their lives without insulting childless people, so I'm not sure at all what the hang up is for those can't seem to do that. Maybe you're just joking, but maybe you also need to know that it hurts. What I do know for sure is this -- you'll keep insulting Sarah with your "you're not busy" comments, and she -- she'll keep bringing you donations, volunteering at your event, and baking for you. Whether she slept last night or not. Dedicated to Sarah -- who has the most generous spirit of anyone I've ever met. Sarah and me. Having fun at one of our volunteering events.